What an outstanding presentation you made to our groups! A perfect message delivered in an extraordinary way. Thank you for being such a professional. Thank you for an outstanding presentation at the Missouri School Counselor Association Conference in Osage Beach, Missouri. Those in attendance praised your presentation, music and personal connection. Your keynote presentation, Don’t Doubt the Dream, was moving and inspirational, the perfect motivational presentation to end our conference. The information provided will positively impact our work with students. On behalf of the MSCA Program Committee, we thank you, Jerry. The conference ended on such a positive note because of you. The tribute video you prepared for the School Counselors of Missouri will be treasured for years to come. Please let me know if there is anything I can ever do to support your work! Thank you for your keynote address at the Successful Schools Conference. Your message was right on the mark for helping to build a sense of optimism and enthusiasm for the important work we do. I heard many favorable comments about your presentation, and I know your involvement helped to make this event very successful. Reflecting on the many exciting issues and developments taking place in education today, your ideas and enthusiasm are reminders of the importance of making continued investment in elementary and secondary education a long-term priority. The positive enthusiasm at the conference has helped to create a sense of momentum that I know will translate into the coming school year. It is a joy to be associated with individuals capable of helping to ensure that our schools get off to such a positive early start. I feel the need to express my gratitude to you for the excellent presentation yesterday. Teachers continue to come by my office and stop me when I’m out to tell me how much they enjoyed the day. “The best speaker I’ve ever heard” is the most common remark teachers make. On behalf of the Athens Independent School District, I would like to commend you for your outstanding contribution toward making our district have a successful school year. You have changed hearts, minds, and definitely teaching strategies. Thanks for making such a difference in our lives! We were so pleased to host you for our opening day convocation. Your message, “Don’t Doubt the Dream” really reached into the hearts and minds of our teachers. We all have so many challenges each day to reach our children. Your message truly emphasized the importance that we play in the lives of our children. You reminded all of us that our kids so very much need us to love them and to be an anchor in their lives. Our teachers universally asked me to extend to you their gratitude for reminding them why they teach. You’re really terrific. I am pleased to recommend you to any superintendent. On behalf of the CACE In-Service Committee I would like to express our sincere appreciation for the outstanding keynote presentation and follow up breakout session at our fall workshop. In fact, outstanding may be an understatement. With nearly 40 years of experience in public education, I thought it was the best keynote that I have ever attended. The evaluations of the other teachers and administrators who attended are echoing the same positive sentiments. Your life story, combined with anecdotes from your actual teaching experience presented with visuals and music, creates a unique and potentially life changing experience for educators. Don’t Doubt the Dream gets at the real “stuff” in education that needs ot be done in order to assure success for all students. The follow-up session, Creating Positive Outcomes For All Young People, received equally rave reviews from the nearly 100 educators who attended the session. Thank you so much for sharing your story and for traveling so far North to meet with our teachers and administrators. I hope your visit to Maine was enjoyable and that you return often. In the previous four years, we have brought in various national presenters who kicked off our Opening Day and Conference Day activities for our teachers and administrators. I can say, however, that your heart warming, inspirational message was the BEST we have seen in the Corning-Painted Post Area School District. To see close to 1000 staff members give you a two-minute standing ovation was all I needed to see. I have received many messages from teachers and administrators, which indicated over-whelming support and thanks for bringing you to Corning-Painted Post. To say your presentation was a hit is an understatement! On behalf of the Corning-Painted Post Area School District, thank you for sharing your very important message with us. It is one we will not forget. For each of the five previous annual Under the Umbrella Conferences presented by the CPS Teachers Academy for Professional Development, we were fortunate to have had excellent keynote speakers. But never had 1200 educators stood and cheered for a speaker until you delivered the keynote at the Under the Umbrella conference. 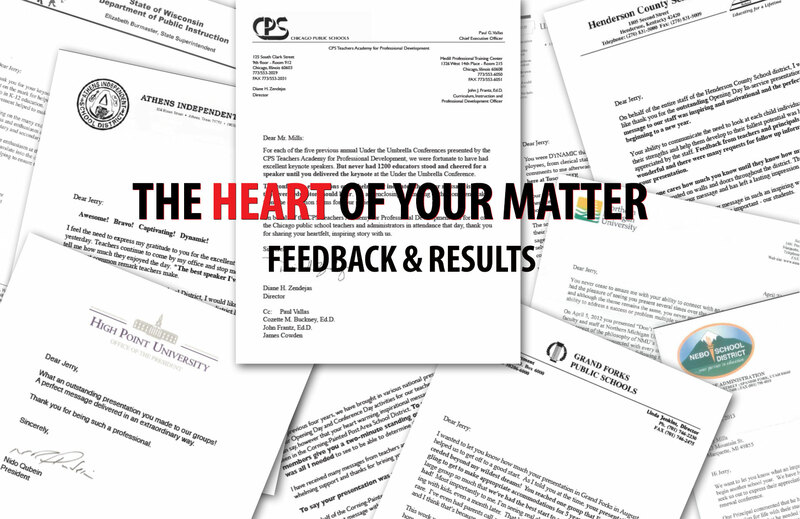 The conference evaluations overwhelmingly indicated that your message is one that every educator should hear. We are enclosing a sampling of the comments taken from the evaluation forms for your review. On behalf o the CPS Teachers Academy for Professional Development and for all of the Chicago public school teachers and administrators in attendance that day, thank you for sharing your heartfelt, inspiring story with us. I wanted to let you know how much your presentation in Grand Forks in August helped us get off to a good start. As I told you at the time, your presentation succeed beyond my wildest dreams! You reached one group that I’ve been struggling to get to make appropriate accommodations for 5 years. You inspired the large group so much that we’ve had the best start to our school year we’ve ever had! Most importantly to me, I am seeing real change in the way teachers are working with kids, even a month later. That kind of lasting change is so important, and so rare. I’ve even had parents call and say that this is a much better year for their child, and I think that’s because you reached the hearts of teachers. This work you’re doing is so valuable. It must be hard for you to be away from home so much, but we appreciate the sacrifice you and your family makes. It really does make a difference in the work of teachers and in the lives of kids. Thank you so much for coming to Grand Forks. I hope we can do it again! On behalf of the entire staff at the Henderson County School district, I would like to thank you for the outstanding Opening Day In-service presentation. Your message to our staff was inspiring and motivational and the perfect beginning to a new year. Your ability to communicate the need to look at each child individually and find their strengths and help them develop to their fullest potential was heard and appreciated by the staff. Feedback from teachers and principals has been wonderful and there were many requests for follow up information about your presentation. “No one cares how much you know until they know how much you care” has been posted on walls and doors throughout the district. This has become the “reminder” of your message and has left a lasting impression. Thank you for sharing your message in such an inspiring way and helping our staff become focused on what is important – our students. I am writing to thank you again for participating as the keynote presenter for the opening session of Kappa Delta Pi’s Convocation in Orlando, Florida in October. Your message resonated with all in attendance. Though our audience was a very diverse group of educators, from undergraduate students to university faculty and k-12 educators, your presentation was very well received. It was inspiring in its message, entertaining in its delivery, and affirming for those in the profession of teaching. Sharing the classroom experience and its challenges from the student’s perspective engaged the audience both emotionally and professionally. Your music and lyrics speaks to the passion that is at the core of all educators. The audience left inspired to ponder your messages and its implication for them as they lead all students in the learning process. We appreciate you sharing your many talents with our Convocation attendees. You set the perfect tone for kicking off our conference! You never cease to amaze me with your ability to connect with an audience of educators. I have had the pleasure of seeing you present several times over the course of my career in education and although the theme remains the same, you never present the message in the same way. Your ability to address a success or problem multiple ways is stellar. Recently, you presented “Don’t Doubt the Dream” to 100 of our teacher candidates, faculty and staff at Northern Michigan University. Your presentation reinforced and expanded on every aspect of the philosophy of NMU’s Teacher Education Program. Your use of personal story, data and song connected with every one of us. The debriefing of your presentation in subsequent class periods over the following two weeks was further evidence that you had a positive impact on our teacher candidates. I would also comment on the way in which you presented. The preparation before and the adjustments you made during your presentation modeled accomplished teaching. Our candidates not only saw someone knowledgeable in their content, but they also saw someone who models excellent teaching. We are proud to call you a member of our team Jerry. I look forward to connecting with you again as we all work to create teachers who have the capacity to advance every child as an individual learner. Believe me when I say that we all left your presentation with no doubts that we have the power to make a difference in every child’s life. Thank you for the lasting impact you have had on the lives of our children. It was a tremendous pleasure to welcome you to our district in August. You brought with you a message of inspiration and hope that touched the minds and hearts of our teachers. From time to time, teachers need to be reminded of the possibilities in their work. You helped our teachers look beyond the immediate and into the messy middle of the problems and opportunities that are present in teaching. You gave hope that teachers can make a difference. Your presentation inspired our teachers, calling them to excellence. We look forward to the next time that we welcome you back to our district. You were DYNAMIC this morning at TISD. Several employees, from clerical staff to bus drivers to custodians, support staff, and teachers made comments to me afterwards that this was by far one of the best presentations we have ever had here! Your message, “Don’t Doubt the Dream” touched every employee group! I know they are energized for the school year and are ready to work with EVERY student in the classrooms, or on their busses, or in their charge for extra help. The songs you use in your presentation are very touching. Many told me they had tears in their eyes at the end. That includes me when you sang “Don’t Doubt the Dream.” Your message conveys that no matter what our circumstances, we can keep our dreams alive for ourselves and for those we work with every day. Keep up your wonderful work, Jerry, and spread your messages as far and wide as you can everyday! You present a very worthy program. We want to let you know what an impact your presentation seems to be having on our employees as they begin another school year. We have had several principals, teachers, as well as classified personnel, seek us out to express their appreciation for the inspiring message you shared with them at our opening renewal conference. One Principal commented that he had been talking to faculty members about how important it is to share their passion for life with their students. The message you delivered, he said, about being the spark for others, is exactly what he needed to use to springboard their next discussions and actions school wide. Others commented that your message would be one that will be reviewed and will resonate throughout the entire year. Still others want to make it a major focus in the schools and classrooms. Your story is very touching and you delivered it in a way that stamped a mental impression in the minds of many of our employees. It is an impression that hopefully employees will recall as they strive to positively impact students and their life choices. Thanks again for joining with us and making a difference for all of us here in Nebo District.